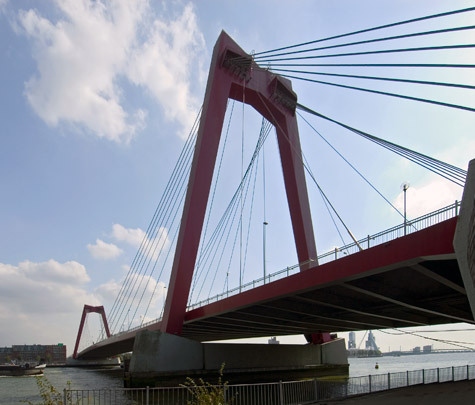 In the 1970s the old steel Willemsbrug linking Noordereiland and the north bank of the Maas was replaced by a new bridge able to accommodate the increase in traffic. Its deck is held aloft by a system of tie rods attached to two V-shaped steel towers the colour of red lead. Almost immediately on completion the new Willems Bridge joined the skyline of the new high rises along Boompjes boulevard as one of the most engaging icons of what was once again a dynamic city.